(Nanowerk News) Scientists of the Research Center for Photovoltaics at the National Institute of Advanced Industrial Science and Technology (AIST) have demonstrated the world's highest photovoltaic energy conversion efficiency among monolithically integrated flexible solar cell submodules (independently certified efficiency) of 15.9 % (aperture area: 75.7 cm2) using a CIGS thin film (a solar cell material). Lightweight and flexible solar cells are attracting attention as a key technology for wider use of photovoltaic power generation; we can expect wider applications because they can be installed even at locations where current solar cell panel modules cannot be installed. However, it was extremely difficult to obtain photovoltaic energy conversion efficiency higher than 10 % in a flexible solar cell module of an integrated structure. We have worked on the technical challenges of alkali addition control and integration processes, and succeeded in drastically enhancing the photovoltaic energy conversion efficiency of an integrated-type flexible CIGS solar cell using a submodule-size substrate of the practical use level. The result of this study was published in the 57th Spring Meeting, 2010, of The Japan Society of Applied Physics, held at Tokai University, on March 17–20, 2010, and in the 35th IEEE Photovoltaic Specialists Conference to be held in Hawaii, USA, on June 20–25, 2010. 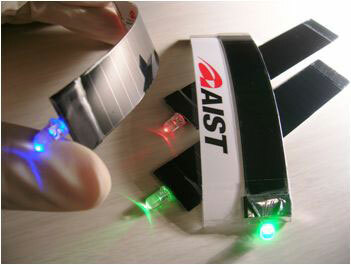 Integrated-type flexible CIGS solar cell modules and lighting LEDs powered by them. In recent years, interest in photovoltaic power generation is increasing worldwide. Though crystalline silicon solar cells are the main solar cells, other solar cells of various types became available in the market. Above all, a CIGS solar cell is a thin-film solar cell having the following advantages: high photovoltaic energy conversion efficiency, excellent long-term reliability (the cell is free from deterioration due to aging), and solid black color. Low cost manufacturing of the cell is also expected. In addition, the energy payback time is about one year, roughly half that of a conventional polycrystalline silicon solar cell. Features such as being light and flexible allow a thin-film solar cell to be installed where conventional solar cells cannot be installed, for example a place with weight limit and/or curved surfaces. Its use as a power supply for mobile devices is also expected, and the advent of high-performance flexible solar cells is in demand. Since the highest conversion efficiency among thin-film solar cells is realized by the CIGS solar cell, the realization of a high-performance flexible CIGS solar cell module was strongly desired. AIST is promoting the development of technologies for high-performance and highly functional solar cells of various types and for evaluation of them, toward a wider use of photovoltaic power generation and the realization of a sustainable society. The Thin Film Compound Semiconductor Team of Research Center for Photovoltaics is in charge of solar cells with a CIGS thin film, and is pursuing the research and development of the cells in collaboration with universities and companies. A commercial panel-type CIGS solar cell module has an integrated structure where several solar cells are connected in series on a glass substrate (Fig. 1, left). On the other hand, in flexible CIGS solar cell modules, thus far, a solar cell (unit cell) is prepared on each substrate made of metal foil, and several solar cells are connected using metal electrodes to form a grid electrode structure (Fig. 1, right). It is difficult to form an integrated structure on a flexible substrate, and we cannot realize high photovoltaic energy conversion efficiency because of the problems posed by the requirements such as high-precision alkali addition control. It is noted that flexible solar cells fabricated using crystalline materials such as GaAs (gallium arsenide) and silicon also have the grid electrode structures. Fig. 1 External appearances and schematic cross-sectional structures of integrated-type (left) and grid-electrode-type (right) modules. By using an integrated structure, no grid electrode nor bus bar on the solar cell surface is necessary, and a high voltage can be provided even by a single solar cell module sheet. If a high-efficiency integrated-type flexible solar cell is realized, we can find wider applications by making use of the advantages such as the flexibility in designing final products and the convenience of construction. Thus, AIST has met the challenge of realizing an unprecedentedly high-performance integrated-type flexible CIGS solar cell module by applying and extending the technologies that AIST has cultivated so far. So far, AIST developed integration process technologies such as laser scribing and mechanical scribing to cut, for example, a CIGS layer into strings having a width of several millimeters with spaces of several tens of micrometers between the strings, and it realized the world's highest level of performance of integrated-type submodules using glass substrates. The technology was further enhanced and specialized in flexible substrates, and we have succeeded in integrating CIGS solar cells using a flexible ceramic substrate. In a CIGS solar cell, a performance improving effect, called the alkali effect, is known where high photovoltaic energy conversion efficiency is obtained by adding an alkali metal such as Na (sodium). When we use a substrate, except for soda-lime glass for a panel-type module, a technology for high-precision alkali control is needed to enhance photovoltaic energy conversion efficiencies. AIST established a technology of controlling the alkali content in a CIGS layer through the formation of an alkali-silicate glass thin layer as a stable alkali source and by controlling the formation condition. This technique was applied to a submodule-size flexible substrate to develop a CIGS solar cell. 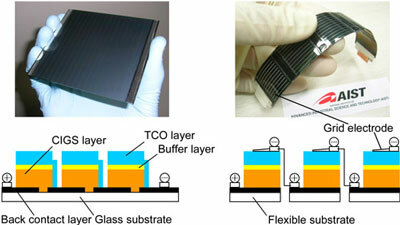 A flexible ceramic substrate is used in developing the CIGS solar cell. An ultra thin (0.1 µm) alkali-silicate glass layer was formed on the substrate to realize a performance enhancement by the alkali effect, and a back contact electrode layer of molybdenum was formed on this layer. Then, a CIGS film, i.e., the power generation layer, with the thickness of about 2 µm was formed by the evaporation method. Figure 3 shows the external appearance of the developed integrated-type flexible CIGS submodule and a rectangular CIGS solar cell module having a length of 10 cm and a width of 2 cm, fabricated from the submodule by cutting, which is illuminated by fluorescent light so as to generate electricity to let the LEDs emit light. Fig. 3 (left) External appearance of an integrated-type submodule fabricated using a ceramic substrate of 100 µm in thickness and 10 × 10 cm2 in size; (right) A flexible solar cell module, fabricated by cutting from the submodule using a substrate of 300 µm in thickness (size is the same), powering an LED to emit light. The voltage to be provided from a sheet of CIGS solar cell is less than 1 V, equivalent to that of a single solar cell, in the case of a grid-electrode-type module. Voltages higher than 10 V can be obtained in proportion to the number of serially connected solar cells in an integrated-type module. Therefore, the integrated-type solar cell module can drive a device that requires a high operating voltage. Further, the integrated-type solar cell module functions even if the light-receiving surface is partially shadowed. The element technologies developed to enhance the efficiency of the integrated-type flexible solar cell submodule can be basically applied to various types of substrate materials. We will drive forward the research and development toward their applicability to larger-area substrates as well as the realization of lower-cost and higher-performance integrated-type flexible solar cell modules and industrialization through collaboration with companies.